Alright alright alright! Happy birthday to Matthew McConaughey and happy early Thanksgiving to the people to Lawrenceburg, Kentucky! The Oscar-winning actor turned 48 on Saturday and surprised residents by delivering them free frozen turkeys, donated by Butterball, as part of a Wild Turkey initiative. The actor is a celebrity spokesman for the bourbon brand and also often does charity work with his Just Keep Livin' Foundation. A video posted on his Facebook page showed him going to a house full of women, who deemed themselves the "hot mamas." "Hot mamas?" he asked. "That's my nickname for my wife. I can't call ya'll that." McConaughey took pics with the women, who wished him a happy birthday. One of them jokingly asked him if he brought any Wild Turkey bourbon with him. "No, I did not bring Wild Turkey. There's a Wild Turkey hidden inside the turkey," he joked back. 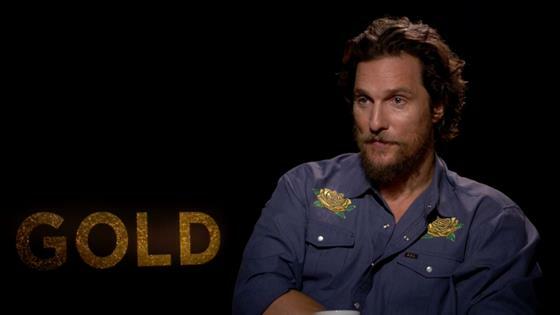 McConaughey had even surprised the people who headed the initiative—250 volunteers at the town's Wild Turkey Distillery, just by showing up to help. The group was tasked with delivering a total of 4,500 free turkeys. "Thanksgiving, gratitude, we believe in our family that the more you're thankful for, the more that you show gratification, the more that you're gonna create in your life to be thankful for," the actor told the volunteers, as seen in another video posted on his Facebook page. "I think it's kinda scientific and here's kind of living proof of it right here this morning." "Let's go make some people happy and put some smiles on some faces, deliver some turkeys, there's some people that are gonna be happy to get 'em," he said. "Just keep livin', thanks for being here." Other residents who met McConaughey also posted photos of themselves with the actor on Instagram. "Happy Birthday, Matthew!! #fangirl #wildturkeygivesback #wildturkey #mcconaughey," wrote user @chasity_beasley.